Just eight weeks since they wrapped up a nine-month tour for their latest LP, Wild and Reckless, Blitzen Trapper got back on the road to trek across North America in support of Sub Pop's 10th Anniversary Deluxe Edition of their fourth album, Furr. Opening the evening's festivities were fellow Oregonians Candace. Playing gorgeous shimmering shoegaze filtered through classic rock structures, and flanked by Sarah Rose and Sarah Nienaber's two-part harmonies, the trio received an enthusiastic response from the growing Friday night crowd. 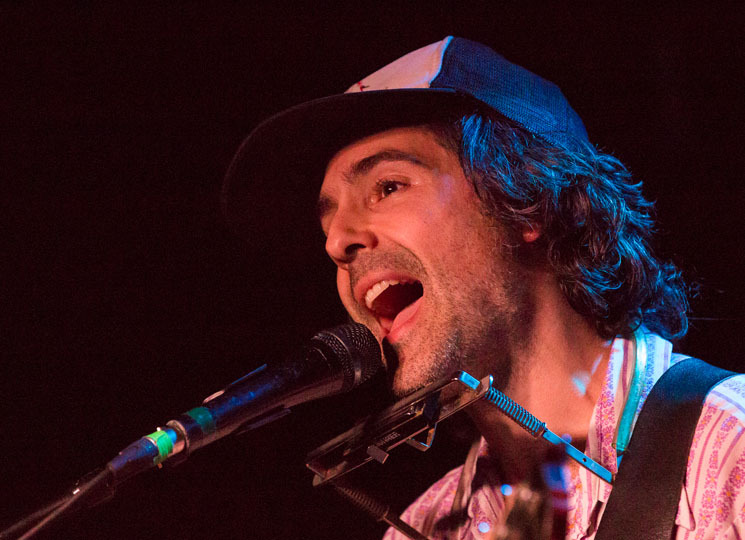 Surrounded by a swarm of equipment and instruments, the five members of Blitzen Trapper walked on stage, as vocalist/guitarist Eric Early welcomed the crowd before humorously forgetting which city he was in. Kicking things off with versions of "Sleepytime in the Western World" and "Gold for Bread," the band managed to give each track a raucous extended outro, ramping up the on-stage energy immediately. Trading his electric guitar for an acoustic, Early began to strum the opening chords to "Furr" to wild cheers from the room. As the crowd howled and sang along in unison, the band looked surprised and flattered, prompting keyboardist Marty Marquis to tell the audience that they, "won Canada for the Furr competition." Moving through the rest of Furr, Blitzen Trapper received the same love for their quirky, previously rarely-performed material like "Love U" and "War on Machines" as they did for album favourites like "Black River Killer" and "Not Your Lover." Moving on to the album's penultimate track, "Echo/Always On/EZ Con," members of Candace rushed into the crowd just in time for Blitzen Trapper to stretch the normally tame composition into a synth-addled freakout, prompting the rest of the club to join in on the impromptu dance party. After ending their run-through of Furr with the luminous "Lady on the Water," Early and drummer Brian Adrian Koch (switching to melodica) stayed on stage to perform two previously-unreleased tracks, "Booksmart Baby" and "War is Placebo," from the album's deluxe edition. As the three other members jumped back on stage, the band ripped through selections from their catalogue, like "Astronaut", from 2011's American Goldwing, "Devil's A-Go-Go" from 2007's Wild Mountain Nation and the title track from their latest, all while the crowd continued to dance up a frenzy. Returning for an encore that included "Rebel" and "All Across This Land," Blitzen Trapper left the Ottawa crowd sweaty, tired and ecstatic, while the audience left Blitzen Trapper with a night they won't soon forget.